The approach to selecting the large trees, is that the trees must have been available in New Zealand before 1900. However, we had to eliminate any trees that are a pest plant due to their tendency to sucker or spread by seed. We first looked at what is growing locally in the remnants of old settler gardens. We then looked at pre 1900 catalogues, and books such as Wellington's Heritage: Plants, Gardens and Landscape by Winsome Shepherd. We considered whether the trees would withstand the wind and frost on the site, and what might grow well in the low lying damp areas. Site visits were made to the Wellington Botanical Garden and to Gear Homestead in Porirua to study how the trees look in a garden setting. Aesculus Carnea. Pink Horse Chestnut. Catalogue: William Wilson McCardle, Wellington. Supplier: Leafland Trees, Palmerston North. Planted: 2018. Gum tree lawn, by Celia Wade-Brown on Sunday, 10 June, 2018. Aesculus Carnea Briottii. Red Horse Chestnut. A handsome deciduous tree with large bold foliage. In spring large upright clusters of rosy crimson flowers decorate the whole tree. Wonderful specimen or shade tree. Prefers a sunny sheltered position in soil that does not completely dry out in summer. Great as a shade, avenue or paddock tree. Catalogue: 1845 James Dickinson, Hobart; 1861 William Hale, Nelson; 1878 William Wilson McCardle, Wellington. Supplier: Leafland Tree Nursery, Palmerston North. Planted: 2017. South-western edge of flower bank. 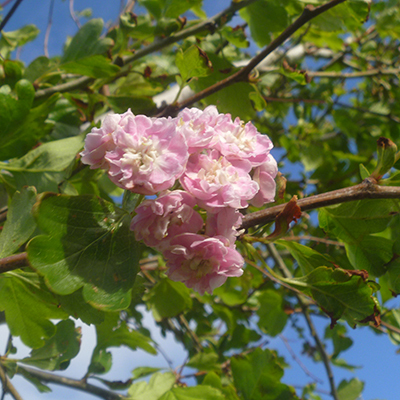 Crataegus Rosea Flore Pleno. 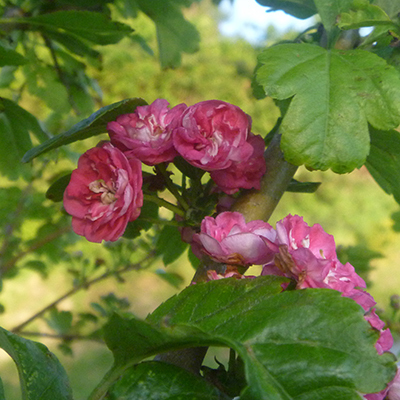 Pink hawthorn. Great masses of double, delightful, fragrant pink blooms put on a showy display in late spring. The flowers eventually turn into red berries in the autumn. A hardy specimen tree that can be used for shelter as it is wind tolerant. Deciduous. Supplier original: Leafland Tree Nursery, Palmerston North. Planted: 2017. Gum tree lawn. After splitting in a severe wind, this tree was replanted on the horse paddock fence line, with the head pegged down, in the hope that it would shoot up as a hedging plant. It didn't, and reverted to root stock. A replacement tree was purchased in 2018. Supplier replacement: Wairere Nursery, Gordonton. Planted: 2018. Gum tree lawn. Crataegus. Scarlett hawthorn (x 2). English Hawthorn. A hardy and robust tree with dark green indented foliage and branches that are laden with little, deep rose red flowers in spring. The flowers are followed by red berries. Happiest in the sun. Deciduous. Planted: 2017. Gum tree lawn. Fagus sylvatica. European or English Beech (x 3). A stately spreading tree often found majestically in parks. Fresh medium green leaves grace the tree in spring turning to brilliant gold and then copper late autumn. Retains some copper foliage throughout the winter. Also makes a very attractive hedge and pleached avenue. Deciduous. Catalogue: 1878 William Wilson McCardle, Wellington. Planted: 2017. Along the top of the stream bank. Fagus sylvatica Purpurea. Copper beech. A magnificent specimen tree for the lawn or paddock. Has coppery coloured spring growth which become dark red to black leaves. We planted this in a prominent position to eventually replace the shelter and shade provided by a fallen macrocarpa, which is still alive but scruffy. Catalogue: 1861 William Hale, Nelson; 1878 William Wilson McCardle, Wellington. Gifter: Glenside Progressive Assn. Inc.. Planted: South east of the flower bank. Planted by Joan Garman, 26 August 2017. A beautiful upright pyramidal tree with unique tulip-or dove-shaped leaves. Foliage a medium green turning to buttery yellow tones in autumn. A great specimen or avenue tree. Deciduous. Planted: 2017. Horse paddock fence line. Green totara. Tall straight pyramidal tree is covered with olive green to bronze needle like leaves. New leaves are a fresh green. Reddish brown bark peels in long strips. Very tough tree tolerating dry and windy conditions. Easily trimmed as a screen or hedge. Excellent street tree. Planted: 2018. Along driveway, on Wednesday, 24 April 2018. Dense, pyramidal form. Masses of scented pale yellow flowers in summer that attract bees. Small heart shaped, lime green leaves that turn yellow in autumn. Excellent hedging or pleaching tree.